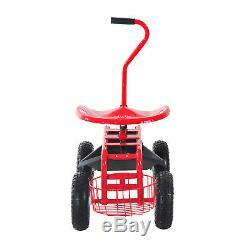 Rolling Garden Cart Planting W/ Tool Tray Basket Swivel Work Seat Heavy Duty Red. 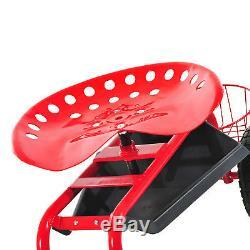 Material: Metal, Rubber Colour: Red Net Weight: 16kg Weight Capacity: 150kg Overall Dimension: 81L x 44.5W x 46-59H (cm) Seat Dimension: 44L x 36W x 0.18T (cm) Tray Dimension: 46L x 40W x 11.5H (cm) Basket Dimension: 29L x 29W x 12H (cm) Wheels Size: 25 x 7 (cm) Custom Label: 845-029. 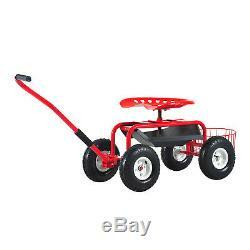 This Outsunny garden trolley is a necessity for any gardener or landscaper. 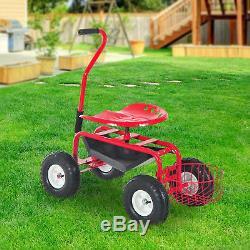 Use it easily move items around and also has a seat so you can tend your plants and landscape with comfort. 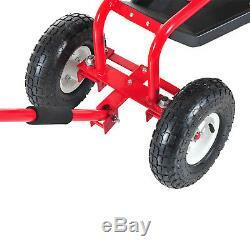 Great for people with back ache as it will make it easier to tend you garden. 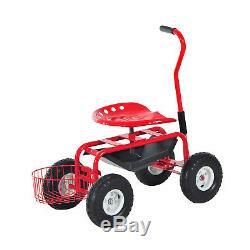 It is made of a metal construction and can be easily moved around on the 4 wheels, the front wheels can steer using the pull handle. 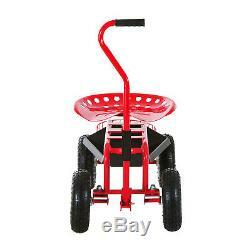 The seat can also swivel and can be height adjustable for greater comfort. 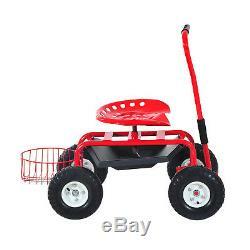 There is a utility basket at the rear and also a tray under the seat for tools. 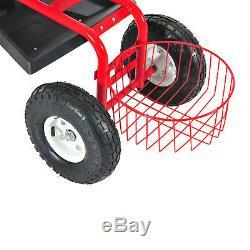 This is great item to have and will be an ideal helping hand. 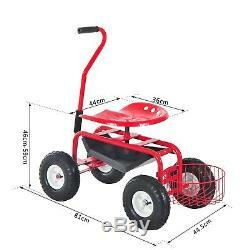 Ideal for those with a yard, nurseries and garden Durable, easy to use, and no more aching knees and painful backs Made with a metal frame Solid steel axles allow for easy steering and mobility Front wheel can be controlled by easy-to-reach turn bar Utility basket and tray cane easily help to store your garden tools Four wheels with 25cm diameter for smooth movement Adjustable height and 360 degree swivel seat for meeting your various needs. MH STAR verifiably manages retail globally with branches in US, Canada, Germany, Spain, Italy and France, we now welcome you to benefit from our prices in the UK. Here at MH STAR, our point is to give you the most ideal choice of great quality on affordable items. Our quality essentially represents itself. All MH STAR items come exclusively from our carefully picked, quality assured alliances. Our goal is to keep up exclusive expectations for the value and services to ease your life. In the event that you require any assistance, kindly don't hesitate to get in touch with one of our accomplished and friendly advisors who will be glad to help, our customer service aim answer to your enquiries within 24 hours. We are unable to change this address for your own safety once the order has been placed. If you change your mind and wish to return the unused items to us, it must be done so within 30 days of the item being delivered. However, if you have any issues in regard to your order, we have a dedicated UK based customer service centre who will be delighted to help and resolve any issues that may arise. My item has reached me damaged/faulty/missing parts, what should I do now? To ensure quick resolution, please attach/include photos and part numbers and ask you to provide this information on first contact. This can be done using the "attach photos" tab located underneath the message box. We aim to respond to all emails within 24 hours and will do all we can to resolve any issues as efficiently as possible. I have changed my mind; can I cancel my order? Please note: If the goods are accepted/signed for, we will not be liable for the return costs. Can I collect my order? We do not offer customer collection as we operate from multiple storage facilities across nation that do not allow public access. You can also benefit from free collection at your nearest Argos by ensuring to choose this option at checkout. When will I receive my order? Are you able to deliver outside of the UK? I have ordered more than one item, will they be delivered together? The products might be originating from various stockrooms or conveyed with various dispatches relegations. How do I track my Item? Once dispatched, your consignment can be tracked (if tracking is available) online via the courier website. I would like my parcel to be left in a secure location, can this be done? I need a VAT Invoice, can this be provided? 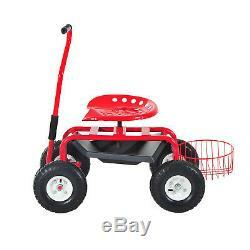 The item "Rolling Garden Cart Planting With Tool Tray Basket Swivel Work Seat Heavy Duty Red" is in sale since Friday, August 19, 2016. 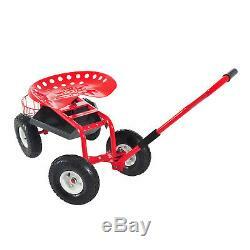 This item is in the category "Garden & Patio\Garden Hand Tools & Equipment\Other Hand Tools & Equipment". The seller is "2011homcom" and is located in London. This item can be shipped to United Kingdom, Austria, Belgium, Bulgaria, Croatia, Cyprus, Czech republic, Denmark, Estonia, Finland, France, Germany, Greece, Hungary, Italy, Latvia, Lithuania, Luxembourg, Malta, Netherlands, Poland, Portugal, Romania, Slovakia, Slovenia, Spain, Sweden, Australia, United States, Canada, Brazil, Japan, New Zealand, China, Israel, Hong Kong, Norway, Indonesia, Malaysia, Mexico, Singapore, South Korea, Switzerland, Taiwan, Thailand, Chile.